Yolo County Marijuana Cultivation Bond • Surety One, Inc. Per Yolo County the Board of Supervisors initially made the determination, "that commercial activities involving nonmedical marijuana in the unincorporated area of the County may adversely affect the health, safety and well-being of the County residents and have the potential for adverse impacts on the County arising from the risks associated with the commercial cultivation, production, storage, processing, manufacture, dispensing, delivery, distribution, laboratory testing, labeling, transportation, provision, or sale of marijuana or marijuana products." To that end, the County established a framework within which cannabis operations can seek licensing for limited cultivation operations. In addition to zoning/land use conformity and filing of a complete application, a Yolo County marijuana bond is required from applicants for a permit. Chapter 20 of the county ordinances addresses the surety bond. Each licensee must, provide the task force a surety bond in the amount of ten thousand dollars ($10,000) issued by a corporate surety authorized to do business in California. The bond must run to the County and be approved by the County Counsel. The Yolo county marijuana surety bond must be conditioned upon full and faithful performance by the licensee of all obligations under the licensing chapter and must remain in full force and effect throughout the life of the license and all renewals. The County may by resolution establish additional bond requirements if deemed necessary. The County may also claim against the bond in the event that a licensee violates any of the provisions of the code or any rules and/or orders of the task force. The ordinance specifically authorizes recovery from the surety bond to cover any abatement costs or administrative penalties. Licensing and compliance with the Yolo County rules is imperative. We recommend that all candidates for a license familiarize themselves with the rules here. Questions may be directed to the staff members that supervise Yolo County medical marijuana operations at cannabis@yolocounty.org. 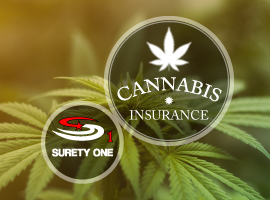 California surety bond leader, SuretyOne.com is the most agile underwriter of the surety bonds needed by the cannabis sector. We firmly believe in supporting the availability of cannabinoid products to patients that benefit from them. We will consider applications for grow operations in every county where current legislation favors legal marijuana businesses.